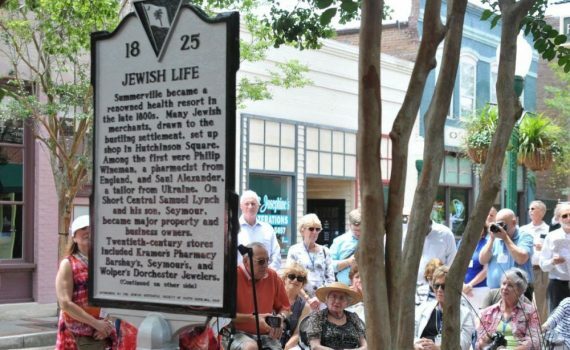 The Summerville Dorchester Museum and the Jewish Historical Society of South Carolina unveiled a historic marker on Short Central on Sunday celebrating Jewish heritage in Summerville. The historical society spent the day in Summerville learning about Jewish life and merchants in Summerville and touring downtown heritage sites and homes. Ernie Marcus, president of the society, said Summerville is an excellent example of Jewish businesses in small Southern towns. The historic marker notes that descendants of these Jewish merchants moved to larger cities in the latter part of the 20th century, but that their legacy endures. “The Saul Alexander Foundation has funded parks in the town as well as cultural and educational organizations in the Lowcountry,” it notes. The Summerville/North Area Jewish Community, founded in 2009 by Patrick Labbe, is revitalizing Jewish life in this area. said he wanted to unite the Jewish community. The group also celebrates the diversity of the Lowcountry and in June will host a panel discussion featuring two pastors, two rabbis and an imam.